Product prices and availability are accurate as of 2019-03-02 02:31:38 EST and are subject to change. Any price and availability information displayed on http://www.amazon.com/ at the time of purchase will apply to the purchase of this product. 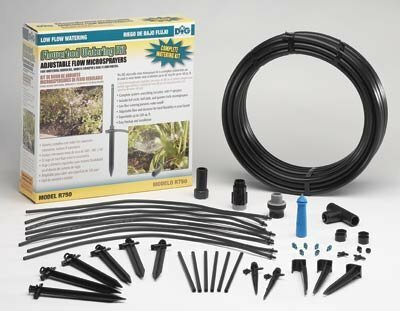 DIG's Adjustable Micro Sprinkler Kit is a complete kit that includes all the parts needed to install a micro sprayer system to water shrubs, groundcovers, flowerbeds and under trees canopy. The kit can cover up to up to 160 SF and can be expanded to cover more than 320 SF using additional drip tubing, micro sprayers and stakes. This adjustable micro-sprayer kit contains all the parts needed to start a system from a faucet or a garden hose that later can be automated. The kit includes a 3/4" backflow preventer, 3/4" 25 PSI pressure regulator, 3/4" swivel adapter, 50' of our premium 1/2" drip tubing with .600 ID x .700 OD, six adjustable stakes, eight micro tubing assemblies and six micro sprayers with 360 Degree, 180 Degree, 90 Degree pattern; also included in this kit are two, 360 Degree adjustable umbrella pattern micro sprayers with 5" stake and 1/4" barb, and all other parts needed in order to complete the installation.